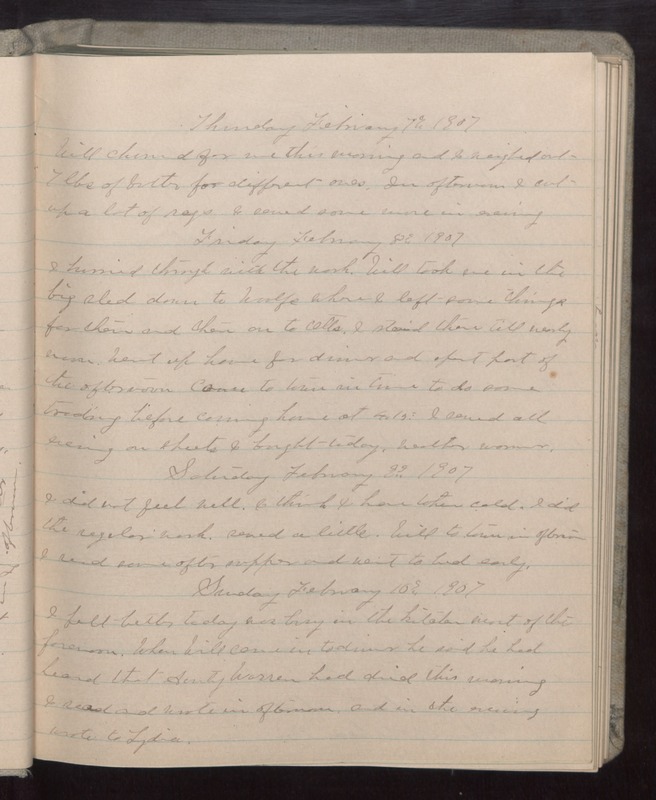 Thursday February 7 1907 Will churned for me this morning and I weighed out 7 lbs of butter for different ones. In afternoon I cut up a lot of rags I sewed some more in evening Friday February 8 1907 I hurried through with the work. Will took me in the big sled down to Woolfs where I left some things for them and then on to Otts. I staid there till nearly noon. Went up home for dinner and spent part of the afternoon Came to town in time to do some [trading?] before coming home at 4.15. I sewed all evening on sheets I bought today. Weather warmer. Saturday February 9 1907 I did not feel well. I think I have [the?] cold. I did the regular work. sewed a little. Will to town in afternoon I read some after supper and went to bed early. Sunday February 19 1907 I felt better today was busy in the kitchen most of the forenoon. When Will came in to dinner he said he had heard that Aunty Warren had died this morning I read and wrote in afternoon, and in the evening wrote to Lydia.